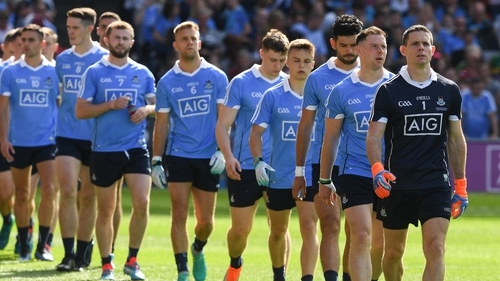 Four-in-a-row champions Dublin have secured 12 All-Star nominations following a year of dominance, including all three choices for Footballer of the Year. Brian Fenton, Ciaran Kilkenny and Jack McCaffrey are up for the top honour, with Kerry's David Clifford and Tyrone's Michael McKernan joining Dub Brian Howard as the Young Footballer of the Year nominees. This year's final triumph against Tyrone means 25-year-old Fenton has played 27 times in the Championship and never lost. He already has two All-Stars under his belt. Kilkenny scored a total of 2-21 in the six Championship games and was outstanding in the final. McCaffrey recovered from a cruciate ligament injury to have another brilliant year for the Dubs. The nominations are divided into three goalkeepers, 18 defenders, six midfielders and 18 forwards. The final 15 that make up the PwC All-Star Football team of 2018 will be presented with their awards at a gala black-tie banquet in Dublin’s Convention Centre on Friday, 2 November, which will be screened live by RTÉ. Beaten All-Ireland finalists Tyrone received seven nominations as have Galway and Monaghan. The remainder of the breakdown is Kildare and Donegal with three each, Kerry have two and Armagh, Carlow, Fermanagh and Laois receiving one. The selection was voted on by a committee made up of GAA media and GAA president John Horan. Clifford's breakthrough year with the senior Kerry side has resulted in the minor player of the campaign nomination. He scored a memorable goal against Monaghan as part of a strong first season. Howard has shown wisdom beyond his years for Dublin as the 21-year-old firmly established himself in their half-forward line. McKernan completes the nominations for outstanding young player for the campaign, emerging as a new talisman for Tyrone on their run to the final. Horan said: "My congratulations to all of those who have been nominated for these prestigious PwC All-Star Awards. "After the fantastic summer of action that we have just had, with all the extra games and all the extra drama of the new quarter-final football format, it adds even greater honour to be chosen on this shortlist as one of the top performers of the season. "We have a selection of 45 players who lit up our season and we are indebted to them for the sacrifices they make to play Gaelic football at such a high level." The Electric Ireland Minor Football Team of the Year features four players from this year’s All-Ireland Champions, Kerry, as well as two players from this year’s finalists, Galway, with players from Kildare, Monaghan, Derry, Dublin and Meath also making the selection.